What is there TO bring on line? now be sitting in.Test that if you like, by phoning an acquaintance whose patience you're willing to stretch, and describing to him/her your chair or your floor in as rich a detail as you can, and see if you don't discover far more about your floor or chair than you ever imagined! --While describing its texture you notice its sheen. --While describing its sheen you notice that set of scuff marks. While describing those scuff marks you notice those chipped-away areas ... then those places where the colors have faded .... As you describe one detail or aspect you keep noticing others, and still others ... You could fill a dictionary with the detail described from that simple, familiar chair. . . --And so with anything else that you examine closely while describing it aloud to an external focus, a live or potential listener! Here is a key element within the overall Principle of Description: the subtler or less fully defined the region of perception from which you describe in this manner, the very much stronger and more rapid are your gains. --Your gains in conscious perception in that context, which gains result from such concurrent describing-aloud-while-examining. You now know, as easily as that, a good part of how we so easily bring unconscious data conscious without any hypnosis or drugs! --Ranging from conscious accurate recall of birth and early crib experiences, to new inventions and scientific discoveries, to breakthrough concepts for increasing your sales or improving your operations or profits, to resolving what you've let stand between you and achieving your most important goals! --Most of Project Renaissance's methods are simply a matter of setting up in some special context the related perceptions whose examining, while you describe them, will bring into full conscious focus the particular perceptions you were seeking! Bringing on-line your subtler perceptions, understandings and resources and putting these to good practical use: that is what this is all about. Through your own experience in the search for answers and in making sense of data before you: you yourself already know, as a scientist, inventor, engineer, designer or even avocational putterer, householder, check-balancer, or lay citizen, that most of your relevant perceptions and data at any given point are unconscious, pre- or at best marginally conscious, "on the tip of your mind." --Until you've somehow sorted through in such a way as to bring the right relationship between data into focus. You may even have spent some frustrated time knowing you were right on the edges of your sought-for answer, but for awhile had been unable to quite click it into focus. We now understand such matters pretty well. The methods or "recipes" of Project Renaissance let you take full advantage of that understanding. Key to recognizing the magnitude of that available advantage, is to recognize just how small a portion of your perceptions and data is indeed conscious and how immense your unconscious treasure-trove truly is. --How huge is this treasure-trove, carried around with you all your life, is as invisible to you as the fact of wetness is to a fish in the ocean. In nearly every instance of contact with an unrecognized opportunity or with an issue or problem or difficulty, your subtler resources are already and immediately aware of your best answer, insight or response! Virtually all respected researchers and research disciplines of inquiry into human brain and mind function are agreed on one key point. More than a hundred times as much perception and data flow into your unconscious as into your conscious at any given moment. A second important agreement among investigators: virtually all experience and data are still there in your unconscious, whether initially received consciously or unconsciously! The sheer quantity of data available there in your unconscious is staggering to consider. --And we've discovered, published, and teach professionally in person wherever on Earth we're invited to, easy, immediate ways to retrieve such unconscious data. Some of these ways are set forth, in either the problem-solving context,(6) the human problem-solving context,(7) the context of education, learning and personal growth,(8) or the discovery-making, invention-finding, context. (9) We've also discovered something far more significant than this retrieval! .... In short: you cannot even begin to contact a problem, question or other issue without this involved reflex surging up the best available answer--within microseconds! The sidebands of your co-axial consciousness may be carrying far richer information than does that thin strand which you long since hardwired into your conscious-focus receiver. Have you ever had the experience, "Oh, I knew I should have said (or done) such-and such only I didn't!?" Indeed, has anyone not had that experience, and frequently? --Of having the right response square in your sights but overriding it because you thought you "knew better than that?" Our own investigations and experience have taught us that it is not just only on those especially "loud" occasions when our conscious focus is refusing to accept even forceful input from our subtler resources. We've learned that this complex reflex is a continuous, ongoing function, expressing high order in-sights at every instant in back-of-the-mind sensory mental images including, especially, visual mental images. Working with some of these visual mental images in the procedure we call Image Streaming, as taught a few pages hence, we've learned how to bring this ongoing reflex fully conscious so that in virtually every context, these highest-order in-sights (appropriate word, "in sight!") are immediately and reliably available to you. Those insights are there right now, in the back of your mind, and/or in the sidebands of your conscious thinking and perceiving. Right there, somewhere between your ears, are good, often superbly ingenious, answers to virtually every issue and obstacle you face. --Right now! Image Streaming, and Project Renaissance's methods generally, are but a few of the various ways you can bring on line, and make immediately useful, this subtle, ongoing, data sorting answer-proffering reflex and resource. Each time you start to have an idea--and you don't express it to someone or record it in some form or otherwise reinforce it--you are reinforcing the behavior of being uncreative. 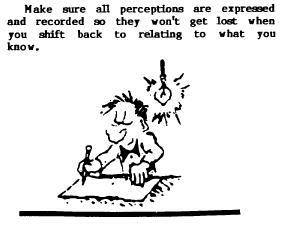 Each time you do express or record it you are reinforcing not only your perception of that idea but the behavior of being creative. Each time you notice something which others likely have not, even if seemingly trivial, like the play of shadows on the wall or the way So-and-So came into the room--and you don't express or record that bit of observation, you are reinforcing the behavior of being unobservant. Each time you do express or record such an observation, you are not only reinforcing that perception a la the Principle of Description, but you are reinforcing the behavior of being perceptive and observant. Quite simply put: how creative you now are, and how observant and perceptive you now are, strictly speaking are a function of your own self-imposed reinforcement schedule, as regards the behaviors of being creative, perceptive, observant! The purpose of "Portable Memory Bank," of carrying around and using a pen and notepad, or index cards, or Post-Its, or even a pocket tape recorder, is to make it more convenient for you to improve your self-reinforcement schedule as regards those behaviors, those traits! More important by far than the individual ideas or observations "captured" is the reinforcing of those traits. To be more creative, observant and perceptive, simply carry around and use that pad or pack or pocket recorder! Simple self-experiment: record 50 observations a day for at least 3 days--and you will find yourself in an entirely different universe than the one you started in! -- or record about three times that many ideas a day for several days to create such an effect! --We have another, much more immediate, illustration of the fact that you have many sidebands of perception and thought active besides the 1-2 strands you've hardwired into where you are mainly conscious from. If you've been reading straight through, and I were to ask you what you were doing and all that was on your consciousness as of five minutes ago, all you could say is, that you were reading this paper. Yet: if I were now to ask--THIS VERY INSTANT!!! ***--what was in your awareness just then!? ?--you'd be able now to describe your awareness of the hum of a distant motor, perhaps the heating or air conditioning; that recent flicker of the lights; the weight of this booklet in your hands; the friction or pressure of your clothing at points of your body which you from time to time adjust; what so-and-so meant by his remarks earlier this morning; is today the day to take out the garbage; was the answer to how I can improve sales on my consciousness five minutes ago? etc. etc. etc. Suddenness is the key, to capture what is going on in fact in the sidebands of your thought and perception at any given moment and, by describing it to notepad or neighbor or tape recorder, to reinforce many of these strands of thought and perception before they fall back away into oblivion alongside last night's dreams. To do so will not only make your awareness many times richer, but you will likely find that some of those sidebands are subtler by far, more comprehensive, more revealing, more intelligent if you will, than those few strands that you've hardwired in. Concentration?--we are finding "concentration" to be a poor strategy. It is self-defeating to try to shut out some awarenesses to get to other awarenesses. our experience is that instead of losing focus as you take more awarenesses in, your awareness just grows more comprehensive, more intelligent, richer, and you can readily focus in on and address whatever you want within the whole while being simultaneously conscious of hundreds of distinct perceptions and strands of thought, more of which are related than you might at first think is the case. Well, where have all those awarenesses and perceptions been hiding all this time?- Answer, they haven't been hiding. You simply failed to express them, thus they went unreinforced, and in each instance, within moments disappeared like a dream. A large part of your intelligence today is determined by what proportion of your own perceptions you somehow expressed, related to or otherwise reinforced when you were much younger. Certainly other factors bear as well, but if virtually none of your perceptions ever get reinforced, you stop paying attention to them and no matter how rich some of those strands of awareness are going on there in your own mind, they never reach consciousness and might as well not exist at all! It may someday count as one of the major discoveries of our time, that you do have ongoing these multiplex sidebands of awareness. --That as you capture and reinforce more of their contents, with "Portable Memory Bank" and/or with repeated use of the [What Was In Your Awareness Just THEN???] stimulus exercise, you do become rapidly more creative, more perceptive, and more intelligent. 1. You are reinforcing the particular perception--as in our example with the floor. You can readily enough test our "Principle of Description" or the Whitman/Blake Effect, discovering more and more and more and more about any perception by describing it in every possible detail to someone while you are examining it. 3. When the perception you are thus reinforcing is initially subtle, meaning that it arose in parts of the brain not so immediately on-line with the verbal speech centers where you are mainly conscious from: you are reinforcing more onto line with consciousness those more remote parts of the brain, together with their resources and their intelligence. As striking as they are (op. cit. ), those sharp gains in "I.Q." may be the least significant part of what's actually going on with this activity, of reinforcing more and more onto line with consciousness the further, subtler, more comprehensive regions of the brain. The richest, most sensitive procedure for developing this aspect, that we've found thus far, is the basic receptive visual thinking procedure we've named "Image Streaming." If it is not already, this can almost immediately be your ability -to receive unexpected, surprise visual and other sensory mental images, carrying information to your conscious mind from the higher, subtler, more comprehensive reaches of your brain and mind. --Not just images you decide consciously to see, such as an oak tree, or a river, or "success," or a big check coming in the mail. ©1998 by Project Renaissance (regarding this internet version only, other copyrights may apply). While we encourage the free distribution of this article (complete text only, including this notice and acknowledgment of source), we do require that expressed permission be granted by Project Renaissance for any major republication. For minor printing and sharing, we only request that you notify us. This version originally published by Matthew Turco at Anakin's Brain (sorry, website temporarily offline). Adapted for access via Project Renaissance's website, October 30, 2000.